David Korslund began his banking career at the storied ShoreBank of Chicago, the nation’s first community development finance bank. He went on to work at a succession of mainstream banking institutions, finally at ABN AMRO, where he had responsibility for managing the planning and performance management process for the full group. He subsequently developed a plan to reorganize European network activities prior to the bank’s takeover by a consortium led by the Royal Bank of Scotland. In 2009 he returned to his banking roots, helping to support the Global Alliance of Banking on Values, a network of banks now 28 strong with over $100 billion in combined assets under management seeking to deliver economic resiliency, environmental regeneration, and social empowerment by lending to individuals and enterprises in the real economy. At a Scorecard convening in October at First Green Bank we captured David and Ken on video as they go deep in a discussion about what it means to be a values-based banker (see video above). In this follow up David shares some GABV Scorecard history and his views on how First Green Bank, and in fact any interested bank, can utilize the Scorecard to guide its regenerative banking practice. 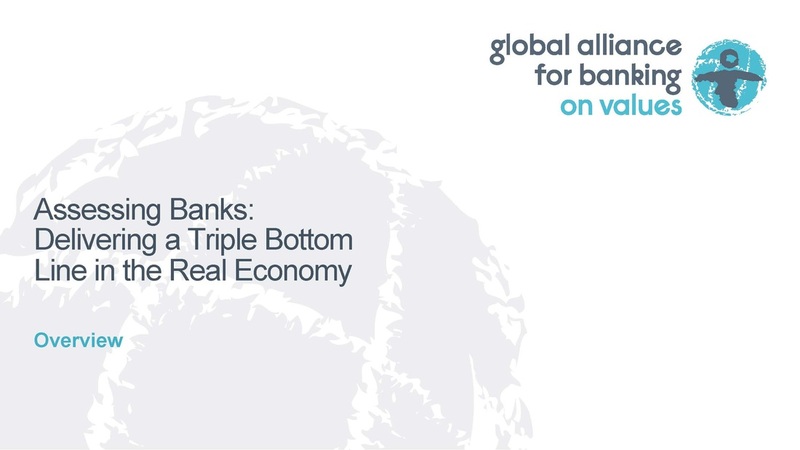 In March 2012, GABV released a report, partially funded by the Rockefeller Foundation, that demonstrated that its member banks were actually outperforming in financial terms those banks whose primary focus was on shareholder value maximization. The most closely watched nonfinancial measure that the Scorecard tracks is the percentage of a bank’s assets that qualify as triple bottom line. “What we came up with to determine that,” David explains, “were two questions that any lending officer in the credit process should be able to answer: does the purpose of this loan deliver at least one of the three bottom lines and does the purpose of this loan do anything that hurts one of those bottom lines? So if you have a situation where you lend to an enterprise that creates jobs but it does that by using child labor or creating pollution then you have a big negative on people or planet and the loan doesn’t qualify.” A grey area in which, David admits, GABV members have yet to reach consensus is where a given loan may have negative impacts but where the borrower has a mitigation plan in place to eliminate that negative. If that plan is sufficiently robust, for example, a loan to an energy company that is historically focused on fossil fuels but is borrowing money to transition to a less fossil-fuel-dependent model, some GABV banks would argue that that loan might still be counted as triple bottom line. “Deep green,” purist GABV members would say it should not.​ These kinds of healthy debates among GABV bankers will continue, and the Scorecard will continue to evolve to reflect them. “I think what makes the Scorecard different from other initiatives,” David explains, “is that it is built by practitioners who are in banks doing good work but with limited resources." Thus far First Green Bank’s greatest values-based success story is its solar push. Solar is installed on all branches owned by the bank. It supplies one third of the Mt. Dora branch’s energy, the majority of its Ormond Beach’s branch, and half of its Clermont branch. The solar-powered Winter Park branch is net zero energy most months, and some months, net-positive. Not only has the bank installed solar on its bank branches, it has been aggressively ramping up the marketing of solar loans: in the first 11 months of 2015 the bank closed $1,774,410 in loans for the purchase and installation of solar PV and hot water systems for a total of 502.88 kW of solar PV, versus $344,549 for a total of 82.885 kW in the same period of 2014. The target for 2016 is 1,000 kW (1 MegaWatt) of solar loans. All solar loans are 100 percent financed, currently at 20-year terms of 5.95% fixed for residential and 10-year balloons at 5.95% fixed for commercial. Most recently the bank extended a 240 kW loan to a bowling alley in Orlando and a 50 kW loan to a historic building in downtown DeLand. Outright grants for solar, extended by the First Green Foundation account for another 230 kW of solar installed to date. ""Not only is First Green Bank leading by example," David points out, "the bank is providing the financing so others can follow." Nearly 100 percent of First Green Bank's $103 million in loans outstanding have been made to real economy businesses. However, although FGB also scores high among GABV banks on financial performance measures, it scores at the low end on its overall triple-bottom-line performance—at 10.73 percent of total assets. But looking at the current snapshot of the bank's values-based assets does not tell the whole story, in David’s view. “You need to look at the environment in which it operates,” he says. “It is really easy if you are a bank in the Netherlands to score high on triple-bottom-line metrics because the values are endemic in the culture and it is easier to find the clients that are aligned with your mission. If you are sitting in Central Florida, on the other hand, it is a whole lot harder.” In fact David argues, First Green Bank can, over time, make powerful impacts on its less than hospitable cultural economy. “Many values-based banks only want to work with those who are already working with best practices,” David says. "I would say if you are looking at salvation, you don't need to focus on those who are already saved, you need to go after the sinner who wants to repent." David maintains that it matters less where a bank begins its regenerative journey; what matters more is how it progresses on it. “I am convinced,” he concludes, “ that with a consistent use of the Scorecard over time the bank will deliver a much higher degree of triple-bottom-line results because the tool by its nature forces that discussion. I think one of the real values of the Scorecard is that it is not just an external or internal tool to rate a bank at a point in time, it is actually a tool the bank can use to think through how it needs to support more individuals and enterprises delivering economic resilience, environmental regeneration, and social empowerment in the community they operate. That is its long-term value."